Overview of the Fantastic Four slot. The Fantastic Four is a very popular superhero group which has been around for over five decades. Stars of myriad comic books, movies and games, the Fantastic Four are known for themes of friendship, family and science gone awry. Now the four, comprised of the Thing, the Invisible Woman, the Human Torch and Mister Fantastic, have a slot game to add to their repertoire. This slot game, developed by Playtech as part of their Marvel series, is a 5-reel video slot with a really strong theme. The four fantastic characters bring along a feature round with four possible variants, playing to the strengths of these iconic stars. Borrowing from the movies as much as the comics, this slot has some excellent artwork and also a pleasant ambient soundtrack. Let’s look closer at the Fantastic Four and this heroic slot game. This famous superhero team was the first ever team created by famous writer and artist duo Stan Lee and Jack Kirby, way back in 1961, before a movie came along in 2005 and a sequel in 2007. A reboot was made in 2015. The team is known by their blue uniforms, which is a colour scheme seen in the movies and definitely in this slot game. The Fantastic Four came about when they were exposed to cosmic rays which changed their biological makeup. Genius Reed Richards became Mister Fantastic, able to stretch and reshape his body. Sue Storm became the Invisible Woman, able to turn invisible and project force fields. Her brother Johnny Storm became the Human Torch who can fly and shoot flames. Ben Grimm became the Thing, his body turned to rock, becoming the toughest of the group and known for his catchphrase ‘it’s clobberin’ time!’. Together they battle threats like Doctor Doom, the metal-clad evil genius. This slot game seems to lean towards the original comic book look of the characters and their uniforms. Each of the four gets a character symbol on the reels, plus each one is animated. For example, Mister Fantastic is shown stretching to impossible height. The other symbols are filled in by 1-10 and AQKJ, in the iconic blue. There is an additional planet symbol which leads into the free games feature. The feature rounds on this slot take place actually on the reels and work around each character showcasing their signature moves. This is a great way to make the most of their iconic, elemental abilities. When Jonny Storm appears to blaze across the reels the animation really is very good and captures the light-hearted action of the movies. There’s also some nice comic themed artwork in the Marvel Jackpot bonus round, using the kinds of eye-popping fonts that suit classic comics well. 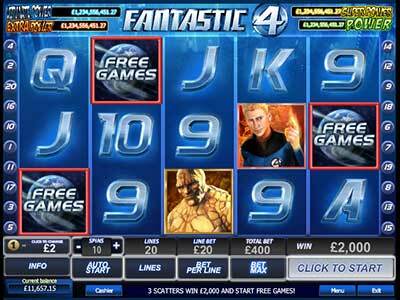 The Fantastic Four slot has 50 lines which may throw off people who are new to slot games. A massive 50 ways to combine symbols may seem like a lot (it’s way over the usual average!) but you don’t really have to worry about them. You can also reduce the lines if you so wish. You will be looking for the Fantastic Four symbols mostly here, with Mister Fantastic being the highest scorer. The 4 logo is wild, but the feature comes into play when you get 3 or more planets. The Free Games feature is where this slot shines. You get 12 free spins to start with, then you need to get one of the Four to appear on the middle reel, triggering a feature themed to that character. Mister Fantastic gives you four extra spins and his symbol becomes an expanding wild, very fitting for his powers! The Invisible Woman awards one total bet and four free spins, plus each time she appears she increase your multiplier by 1. The Human Torch gives you four spins and holds the first reel, then he takes over from the other heroes, appearing on other reels (typical of arrogant Johnny!). Lastly, the Thing lumbers in with just 3 free spins but he becomes wild and stays in place for all remaining spins. This is a very creative way to use their powers as slot mechanics.